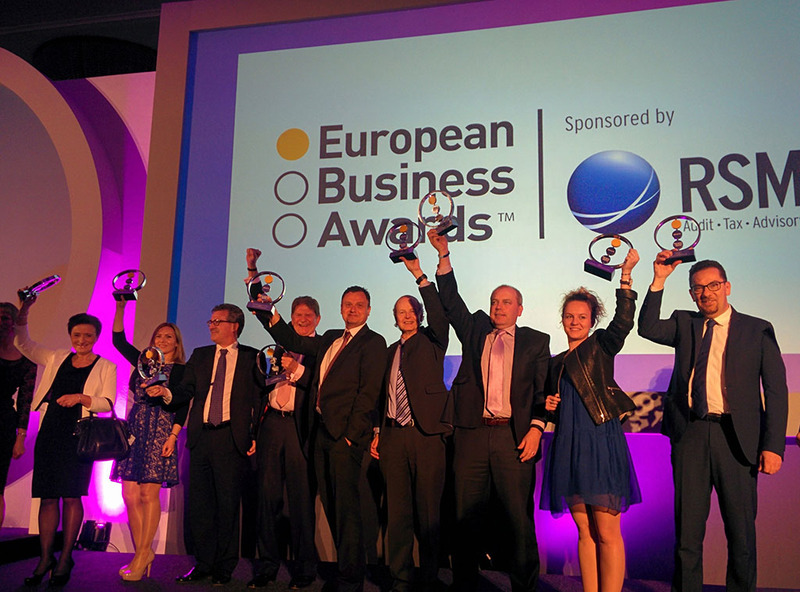 Europe’s 12 best businesses are celebrating after being named winners in the 2014/15 European Business Awards, sponsored by RSM, at an exclusive awards ceremony in London was attended by leading business leaders, politicians, ambassadors and academics from across Europe. The winning businesses have achieved their success after 16 months in the largest, and one of the toughest, business competitions in Europe, which this year attracted over 24,000 businesses and generated over 170,000 votes from the public. Business VIPs presented trophies to the 11 category winners of the competition, the ‘European Public Champion’, and recipient of a Lifetime Achievement Award (listed overleaf). The 11 category winners went through a process of written submissions, video entry judging and face-to-face interviews, and were shortlisted as one of 709 National Champions and 110 Ruban d’Honneur recipients before reaching the final. In the 2014/15 competition, all EU member markets were represented plus Turkey, Norway, Switzerland, Serbia, Croatia and the Former Yugoslav Republic of Macedonia. The combined revenue exceeded €1.5 trillion, and together they generated profits of over €60 billion and employ over 2.5 million people. Supported since their inception by lead sponsor and promoter RSM International, the European Business Awards’ is now in its 9th year and its primary purpose is to support the development of a stronger and more successful business community throughout Europe. For further information about the entering the European Business Awards, the 2015 winners, and to download pictures from the evening, please visit www.businessawardseurope.com. The European Business Awards is now in its 9th year. It attracted over 24,000 businesses to the competition last year and in the public vote generated over 170,000 votes from across Europe. www.businessawardseurope.com. RSM International is the 7th largest network of independent audit, tax and advisory firms, encompassing over 112 countries, 700 offices and 37,400 people internationally. The network’s total fee income is US$4.4 billion. RSM is the 6th largest provider of tax services and audit and accounting services worldwide. RSM International is the lead sponsor and corporate champion of the European Business Awards promoting commercial excellence and recognition of entrepreneurial brilliance.